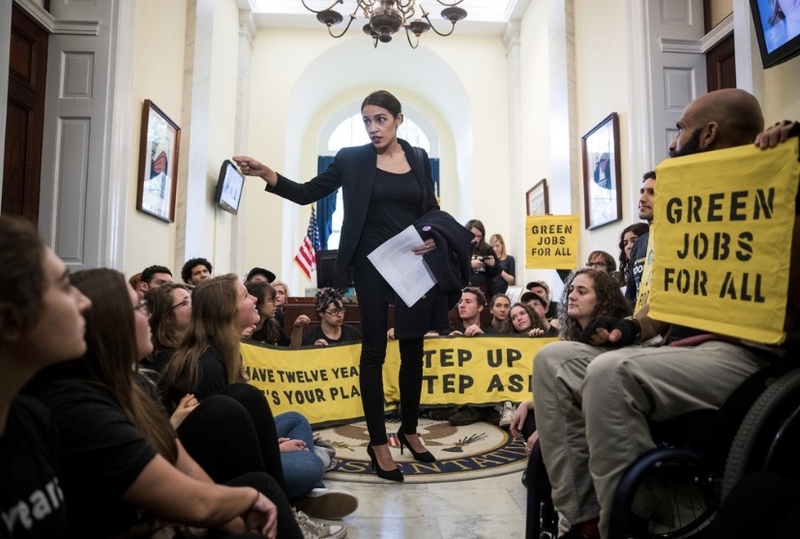 The “Green New Deal,” set forth by Alexandria Ocasio-Cortez and backed by far-left activists, seeks to impose a command economy (socialism) on the US under the pretext of environmentalism. The plan, if implemented, would grant government absolute control over transportation and therefore over the national economy. What if it were possible to achieve a greener economy for free (without taxpayer money) and without burdensome regulations, while creating jobs and prosperity? In fact, not only is a “Free Green Deal” possible, it is already under way thanks to America’s free market system. An entire generation of young people have been raised by teachers, professors, and/or the cultural influences on the Left to believe that the world is being destroyed and a dystopian future awaits them. The mental illness and misery caused by these traumatizing ideas helps to isolate these youngsters from their parents and from communities not built around the ideas of their cultural Marxist influencers. Combined with attacks on the family, churches and synagogues, and other traditional communal units, this has led to a generation of miserable Millennials and Gen-Zers. They have been unable to achieve financial success, in large part due to a weak economy brought on by government interference, and they believe absolutely in these irrational left-wing notions. These young adults are socially isolated, prone to depression, and caught in a cycle of perfectionism where they feel constant performance pressure. They believe socialism to be a good thing, mistaking it for an expanded social welfare state, which they believe would relieve the pressures of their life. In spite of this indoctrination, Millennials are also a generation of cognitive dissonance. A generation that believes the two-parent family is the best family, that doesn’t trust government or authority, and who want their taxes raised under no circumstances whatsoever. In fact, a recent Axios poll found Millennials (those under 45 including younger Gen Xers and Millennials) as the demographic that is driving a national change of heart on the abortion issue, leading the nation in an increasingly pro-life direction. The generation that follows them, Gen Z (born after 2000) are even more confused and isolated. Like the Millennials before them, they are likewise a contradiction. Given the traumatizing propaganda of the left, it is no surprise that a radical environmentalist plan has come forward demanding extreme changes in lifestyle in order to “save the planet.” The so called “Green New Deal” (which NPR attempts to explain in a positive light) is a plan that would involve the elimination of the gas combustion engine, air travel, and would guarantee a “basic income” to the least affluent. If this sounds familiar, it should. As anyone with any knowledge of history knows, it is exactly the plan put forward by Lenin in the Soviet Union, Mao in Communist China, and Venezuela’s Hugo Chavez but with an environmental pretext. These plans all led to one result: repeated great famine. Lenin’s Kolkhoz plan for centralized farming alone led to millions of deaths from mass starvation. It involved forced relocation, the curtailing of freedom of movement, and forced labor in the name of equality for the Proletariat (working class). 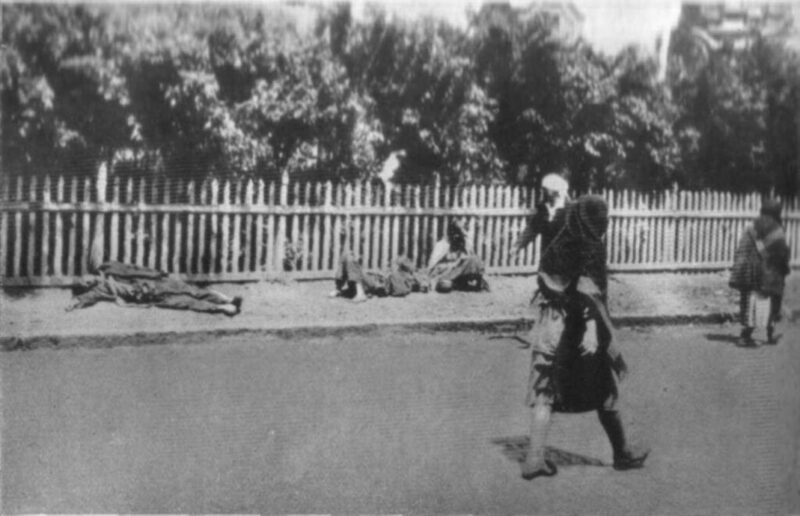 This was before Stalin deliberately starved six or seven million Ukrainians to death in the winter of 1932-33, what is known as the Holodormor; a crime against humanity nearly on a par with the Holocaust. Mao’s farming plan led to perhaps 70 million deaths, no one knows for certain. Imagine an America without air travel, cars, or trucks. How would goods come to market? Electric vehicles are expensive, destructive to the environment (as they consume large amounts of rare minerals), and have a limited range. Wind turbines and solar panels sound good but never generate enough power to offset the energy consumed building them. They also mean at least a trebling of current energy costs. You cannot make something out of nothing. Where is the energy going to come from to produce these electric cars and so called “renewable” energy sources? Probably from the same sources from which we draw energy now: coal, natural gas, and petroleum. Higher energy costs inevitably mean a rationing of energy. The poorest Americans will have to decide whether to wash their clothes in a washing machine or in a pail. Meanwhile, carbon output will end up remaining largely the same. So where is the benefit to the environment? Perhaps that is not the point of the exercise. The reality is, this Green New Deal’s ulterior motive is to have all transportation, housing, and labor controlled by the government. It would not be long after the Green New Deal was implemented that all travel would have to be pre-approved by the government–just as citizens of the USSR once needed “papers” authorizing their travel; rationing would be necessary as rail and electric vehicles cannot provide as much transportation as the current infrastructure. The combined cost of the Green New Deal would be about $93 trillion not to mention the hundreds of trillions of lost future private capital. Since that is a price no one can afford to pay, it can only be achieved through a command (centrally planned) economy. Green is the new Red. It is somewhat comical for urban Millennials to go about advocating an economic system when they are ignorant of even the basics of the how the world works. They lack the knowledge to produce their own food, process it, transport it, or deliver it to consumers. They have no idea how energy is produced and how much work that requires. Yet, this lot enjoys attacking working class people who support Donald Trump as “illiterate” and “ignorant.” America’s workers have the right to hold their opinions, speak their minds, and vote. They produce the food and energy that grants urban Millennials an unprecedented quality of life and do not deserve the disrespect and hate aimed at them. One cannot help but laugh at what might happen to these urban Millennials if they had their wishes granted. What happens when the omnipotent government they think they want decides it needs to tax text messages? When food prices skyrocket? Are they truly willing to give up the smart-phones they will no longer be able to afford, the travel they enjoy, and adopt a subsistence diet? Perhaps then they might have some respect for freedom and those Americans who want to preserve it. A cruel lesson in reality, in the basics of how the world really works, awaits those who advocate for this extremist political agenda. The Green New Deal would lead to a dystopian future indeed. But the path to perdition is paved with good intentions. This is not the first time that apparently well-meaning busy bodies have made a play to assume absolute power, and it will not be the last. Americans need to be certain we nip this in the bud before it is too late. Thankfully, the more Americans learn about this crazy idea, the greater the opposition to it. Don’t have much of an imagination? Well, the truth is, all of this is our current reality. Rising energy costs have motivated Americans to seek greater efficiency. A desire to “save the planet” has led consumers to demand greener products. The magic of the free enterprise system is that producers have to meet consumer demands in order to sell their goods. 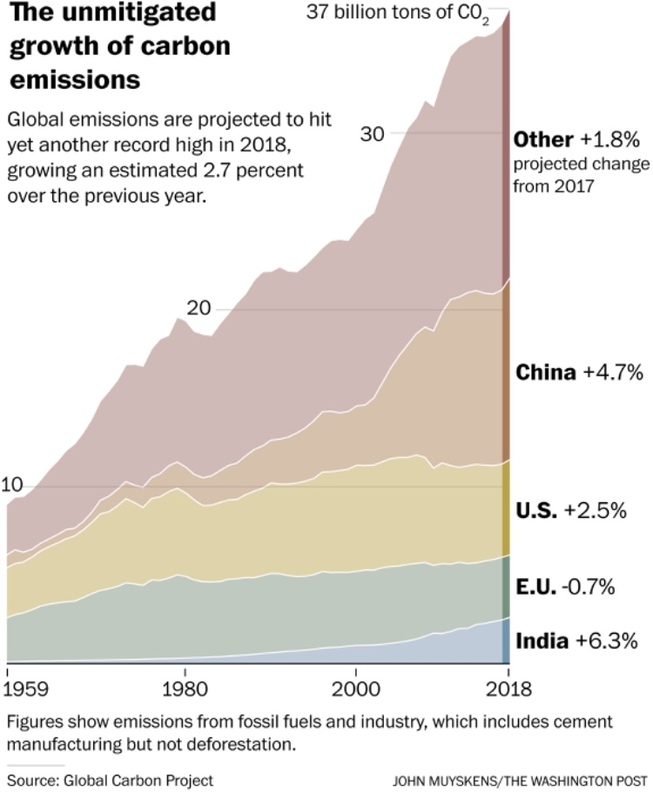 A chart (above) produced by the Global Carbon Project and published by the Washington Post, shows how American emissions are relatively consistent as a percentage of global carbon output and have been for some time. India and China have significantly increased their output. If climate change were truly about carbon output, Ocasio-Cortez would be introducing a plan to aid India and China in reducing their carbon output by applying there the same technologies and processes used in the United States. In terms of achieving real environmental benefits, this would be the direction to go. The silence on these other countries betrays the real motivations behind the Green New Deal, making it painfully obvious that this plan has nothing to do with the environment. Europe has imposed vast regulations throughout their economies stifling competition, raising energy prices, and slowing economic growth (read: reducing economic opportunity), but even European states have stopped short of completely devastating their economies in the name of environmentalism. The US has achieved our relative flat-line in carbon output primarily through free market means. Recent slight increases in US carbon emissions are largely due to the burning off of natural gas at many oil well sites. The infrastructure to capture and properly store the gas is lacking at this time. That infrastructure is being built, because it is profitable to do so. Carbon scrubbers in coal plants and the use of cleaner burning natural gas have also helped. Americans have brought a great deal of social change, economic prosperity, and progress to our society and those of other societies around the world. This was not done because a central authority dictated that it should be the case, it was not achieved through government programs or mandates, instead it happened simply because we the American people wanted it to. The natural result of a free society, with free enterprise, is that consumers hold the ultimate power. Consumers have the power to demand high standards of producers. It is a beautiful system in which people have the right to speak their mind, however it is made up. Who would embrace a belief system that would destroy this precious gift? The answer right now is a group of spoiled brats who think they are smarter than those whose work grants them their comfortable lifestyle.